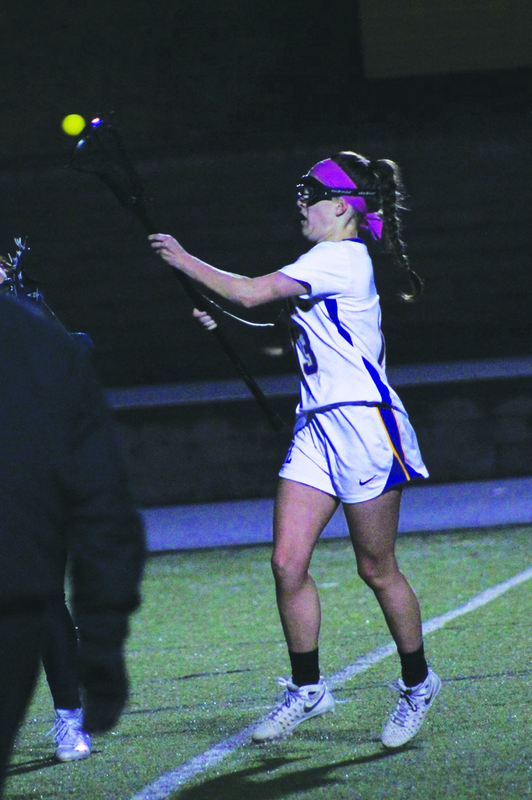 The women’s lacrosse team has had its best year since the program was created back in 2013. Most recently, the Duhawks faced some tough matches against the University of Dubuque, Cornell and Wartburg. They lost two hard-fought contests to the University of Dubuque, 11-8, and Wartburg, 6-5, 2OT, and they posted a convincing win against Cornell, 17-12. Next, the Duhawks surged into the Monmouth game off of a loss to Wartburg but ready to put a world of hurting on some Fighting Scots. The game started off a little slow with the Duhawks trailing the Fighting Scots 2-1, but first-year Olivia Flynn wasn’t going to let them get away with that lead so easy. Flynn went on to score three straight goals to give the Duhawks a 4-2 lead. The Duhawks continued to answer back whenever the Fighting Scots scored. Sophomore Nia Stompanato came in with two goals of her own and was quickly followed by junior Sarah Hanson who scored her first of many goals to come that game. Then sophomore Molly Dougherty came in with her first of two goals. To close out the half, the Duhawks had back-to-back goals from Flynn and from senior Brittany Miller to make the halftime score 10-4. Already dominating the scoreboard and the stats, the Duhawks came out ready to finish the Fighting Scots off in the second half. Hanson came in with her second goal 38-seconds into the second half, followed shortly behind by senior Anna Schwalbe. The Duhawks and the Fighting Scots went back and forth with goals. The goals came from Hanson, Miller, Nelson, and Dougherty. With 3:50 remaining in the game and the Duhawks already leading 14-10, Hanson didn’t let up, scoring three more goals, one of which was with two seconds left. The Duhawks beat the Fighting Scots by 5 points and raise their record to 7-8. Sarah Hanson was the stand-out scoring seven goals, one assist, and extending her goal-scoring streak to 17 straight games with a goal made. This record dates back to the 2016 season. “Sarah Hanson was able to find a great matchup against Monmouth, and she was able to exploit their goalie and score seven goals,” said Coach Sam Koenig. Over the year, the team has become a better team overall, Koenig said, but the individuals also have been improving their skills as well and occasionally making big-time plays. Even though the season is coming to a close, the Duhawks have a chance to end the season with an above .500 record. To make this happen they need to work on communication, game awareness and helping the program move forward. The Duhawks will finish off their regular-season schedule this weekend facing Aurora University on Saturday at noon and Benedictine University Sunday at 1 p.m., both in the Rock Bowl. Sean Whitley is a sports writer for The Lorian.